"The Future of Surveying.... you!!!" The meeting was held 10 February 2016 in Minneapolis, Minnesota USA. Young Surveyors from the region were invited to join this event. The meeting was hosted by and held in conjunction with the Minnesota Society of Professional Surveyors (MSPS) Annual Conference. 10 February 2016, Minneapolis, Minnesota USA. 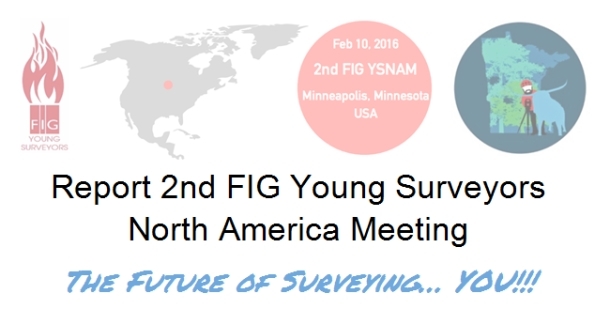 On the 10th of February 2016 the 2nd FIG Young Surveyors North American Meeting (FIG YSNAM) took place in Minneapolis, Minnesota USA. Young Surveyors from the region were invited to join this event. The meeting was hosted by and held in conjunction with the Minnesota Society of Professional Surveyors (MSPS) Annual Conference. The theme of the meeting was ‘The Future of Surveying… YOU!!!’. Key industry leaders were asked to inspire the participants about the future ahead of them. Also the participants learned more about FIG, FIG Young Surveyors Network and NSPS Young Surveyors. The event attracted 60 participants from 6 countries and 23 different states of the USA. For many participants it was their first young surveyor event. In this report the different organizations related to the Young Surveyors are summarized and the results of the meeting are described. FIG is the International Federation of Surveyors (Fédération Internationale des Géomètres). It is an international, UN-recognized non-governmental organization (NGO) whose purpose is to support international collaboration for the progress of surveying in all fields and applications. It provides an international forum for discussion and development aiming to promote professional practice and standards. FIG was founded in 1878 in Paris and was known as the Fédération Internationale des Géomètres. This has become anglicized to the International Federation of Surveyors. FIG representing surveyors in more than 120 countries throughout the world, and its aim is to ensure that the disciplines of surveying and all who practice them meet the needs of the markets and communities that they serve. 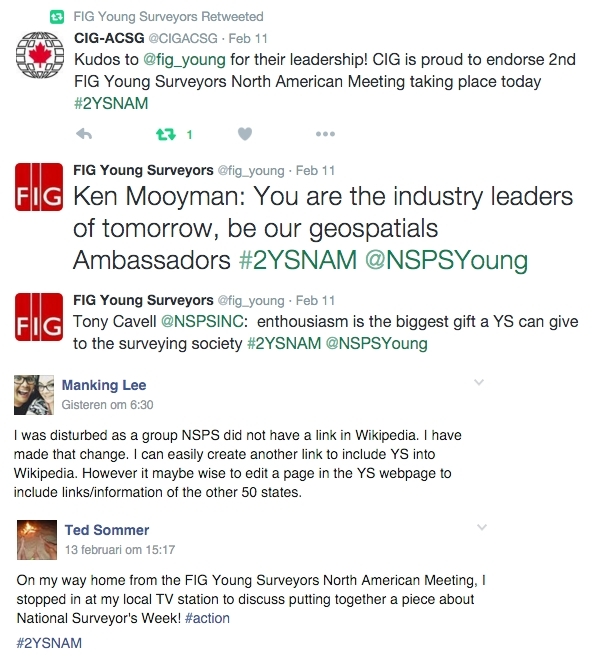 The FIG YSN is established under the umbrella of FIG to address the interests of Young Surveyors worldwide. We are the next generation, the surveyors of tomorrow, together with the FIG Council and its Commissions, UN-Bodies, NGOs and businesses. Surveyors of Tomorrow - it is we who are gonna make a difference in the world! With increasing effects of climate change, increasing population growth and increasing conflicts over the limited resource of land we are facing several challenges - but, and this is the exciting part of it, we have the tools, we have the technology and we have the knowledge.It is the era of change and we can be that change. In our Work Plan we elaborate how we inspire and empower the Young Surveyors to be those agents of change. One of our goals is to organize meetings like the FIG YSNAM and to bring YS from the region together to discuss challenges and to get inspired. The NSPS Young Surveyors Network was inspired by the FIG Young Surveyors Network and focuses our effort and outreach to the Young Surveyors within the United States and is associated with the NSPS, the National Society of Professional Surveyors. The group started in April 2014 and has been growing and working towards solidifying a national network. Our focus has been organizing the group and discussing our future plans. We are finally at a point to start to work at a team for the future of our profession. As first keynote speaker of the day Mr Mooyman set the scene. He spoke about the explosion of maps and geolocation that is taking place. And how that requires professionals to be sure that these maps and geo locations are accurate, complete, and fit for purpose. Ken Mooyman explains: “Geospatial information use has grown to such an extent that in many aspects of our life we can no longer function without it. Through the exponential growth of technology the demand for accurate geospatial information has become greater. This given fact provides numerous opportunities for surveyors as is shown in several examples.” Mr Mooyman believes that we are entering the Golden Age of surveying and that we are the ambassadors that will lead the way. Mr. Fosburgh challenged the young surveyors to think outside the realm of what they might consider surveying. There is a vast array of spatial data out there that needs to be managed. Who better than surveyors to fill those roles! Mr. Fosburgh cautioned the young surveyors not to miss out on the next big technological advance in surveying by not being prepared to embrace a technology not historically considered surveying. The world is evolving and the amounts of spatial data being collected is ever increasing. The possibilities for surveyors to manage, use and interpret that data is endless. Don’t become stuck in the past and unable to adapt. Mr. Bennett provided some great insight into “creating a digital mirror of the physical world.” The geospatial industry today is seeing innovations that are disrupting not only the surveyor’s approach to each project, but also the customer’s expectations of new technologies. Managing disruption, redefining teams and work, optimizing designs and real-time analytics, multidimensional printing and object programming, are all movements that will redefine the future surveyor. The young surveyor will need to leverage new technologies to select the “right tool” to meet the customer’s needs and exposure to these innovative accelerators elevate the prestige of the surveyor and increase the value of the surveyor’s expertise. Lean forward. Mr Buhler spoke about the Public Land Survey System (PLSS) and how they are still surveying new land in Alaska. He also spoke about why some states were included in PLSS and why others were not. Take Texas for instance. Texas was already mostly split up be earlier settlers and there wasn't really enough land left to put it into the PLSS. Don had a very interesting slideshow with links to BLM website and he explained a little about what BLM does and where you can find things on the website. Mr Bitner spoke about the NGS website http://www.ngs.noaa.gov/ and all the great tools that they have to offer. One tool he emphasized on was the Online Positioning User Service (OPUS). This tool is used when you need to solve a static solution. If you need to establish a location and there is not any control around you can create your own. He also told us how we can share our solutions, by going to Share Solution on the OPUS menu, to help make the information they have better. He showed us a map where there are many states that have many federal points and there are some states that have very few federal points. Even though your state has a Continuously Operating Reference Station (CORS) system that does not mean they are part of the federal system. Lastly he talked briefly about replacing NAD 83 and NAVD 88 in 2022. The new datum that will be released will make the entire globe more accurate from one place to another and it will be easier and more cost-effective. Some places may shift very little and other will shift a lot. The new system will rely primarily on Global Navigation Satellite Systems (GNSS). During this session an overview was given of the work of the FIG Young Surveyors Network. Paula Dijkstra provided background information how the network was established, how the FIG YSN is organized and how you can become an (active) member. Also the goals over the work plan were shared with the participants. Melissa Robert from Uruguay shared her experiences promoting FIG and the FIG YSN in South America. In addition to working with young surveyors in Uruguay she was keynote speaker in Argentina during the 5th National Surveying Students Meeting with over 500 participants. She also participated in and was a speaker at the X National Surveying Congress in Colombia. In addition, she participated in the 27th International Cartographic Conference in Brazil. Amanda Askren, chair of the NSPS Young Surveyors Network, gave an overview of the developments of the Young Surveyors Network in the USA since the first FIG YSN Meeting in San Diego in 2014. In less than two years time the network has grown quickly. 38 states are currently represented in the network. Jordan Litke (Canada) shared his experiences about working as a surveyor on Vancouver Island in British Columbia. Thalia Nikolaidou (Canada) explained the GPS Analysis and Positioning Software, GAPS. Alvin Clarke (Jamaica) talked about the education and career of a surveyor in Jamaica. And Peter Flint (Alaska, USA) informed us about the challenges of being a surveyor in Alaska. The four presentations showed how diverse a career as a surveyor can be. A panel composed of Terry Bennett - Autodesk, Inc; Don Buhler - USDI, Bureau of Land Management; Bryn Fosburgh - Trimble Navigation; Steve Frank - New Mexico State University; Lisa Hanni - National Council of Examiners for Engineers and Surveyors (NCEES); Jacob Heck - Young Surveyor and PhD Student and Ohio State University; Ken Mooyman - Hexagon Geosystems NAFTA; and Curt Sumner - National Society of Professional Surveyors was assembled to field questions from the young surveyors in attendance. The panel answered questions about the future of surveying, upcoming changes in the education, licensing and examinations for land surveyors, technology trends and ways for young surveyors to remain relevant the field. The panel closed the session by sharing their thoughts on how young surveyors can position themselves for continued success in the surveying industry. The participants of the 2nd FIG YSNAM were invited on behalf of MSPS to join their annual dinner with their board and special guests at the Horse and Hunt Club. Connie Villari, president of MSPS welcomed the Young Surveyors officially and reflected on the long but fruitful day. Paula Dijkstra thanked Connie and MSPS for the support and hospitality. After that there was time for drinks & dinner. It was a great opportunity to get to know each other, extend the network, make new friends and to have fun. NSPS held a separate meeting on the following day to discuss the challenges and direction for our network. The meeting was well attended and we also recorded the meeting by a webinar, which will be available on the www.nsps.us.com on the Young Surveyors website when posted. The meeting discussed the final organization needed for the group and also discussed the tasks assigned at the last NSPS meeting in October. Based on discussion, we hope to hold annual meetings to continue our work and meet again with our like-minded enthusiastic friends. This Network is to support our future surveyors and we welcome and look forward to those that will make a difference for the future. We appreciate the support that we have received from MSPS as generous host of this meeting and making it possible for all Young Surveyors to participate in their annual meeting. We would also like to take this opportunity to thank our Platinum Sponsors Trimble Navigation and Hexagon Geosystems and the support of the FIG Foundation. Together with the invited speakers and guests, Terry Bennett, Geoff Bitner, Don Buhler, Tony Cavell, Bryn Fosburgh, Steve Frank, Lisa Hanni, Ken Mooyman, Michael Paré and Curt Sumner you have inspired us to become the surveyors of tomorrow. Also we would like to thank the Organizing Team, without their hard work this meeting wouldn’t have been possible: Marcus Hampton (MSPS), Adam Schleicher (NSPS, Wisconsin YS), Eva-Maria Unger (FIG YSN), Paula Dijkstra (FIG YSN). And a special thanks to the support and mentorship of Connie Villari (President, MSPS) and John Hohol (President, FIG Foundation).